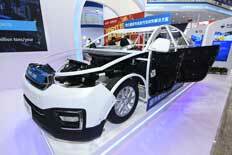 The theme of Chinaplas 2018, "Innovation is Key to the Future" highlights electric, lightweight and intelligent vehicles. The show will be replete with high-tech, energy-saving and environmentally-friendly solutions for automotive industry by more than 1,500 exhibitors. Polymer-based composites, thanks to their light weight, strength, mouldability, elasticity, corrosion resistance and weatherability, play an important role in producing lightweight vehicles. Reduction in weight, a crucial factor of new energy autos, calls for the use of composites, employing which in the making of structural parts and coverings can reduce weights by about 30%. Beijing Tiangang Auxiliary Co Ltd will introduce new applications of the “Targeted Nano Enhancement Technology” at Chinaplas 2018 for the automotive industry to achieve thin-wall and lightweight goals. The technology makes use of the special targeted release and enhancement of high performance nano particles and facilitates the nano dispersion of functional additives in polymer composites, improving a number of properties, such as higher crystallisation, better mechanical properties, melt flows, processing properties and lower VOC. This year, DSM, a Chinaplas veteran, will be showcasing its Stanyl HGR2 PA46 resin. DSM’s Stanyl HGR2 PA46 resin is powered by a 5.0L V8 engine as a drop-in replacement for PA66, providing enhanced wear and friction performance. Environmental benefits include reductions in gas consumption and green-house gas emissions. The resin has already been used in chain tensioner arms in the Ford F-150 and Mustang, and will be utilised on more vehicles beginning in 2018. The EC-SXII series of all-electric injection moulding machines from Shanghai Toshiba Machine Co, Ltd is equipped with more advanced injection capability compared to the previous EC-SX series. The machines are expected to better meet customer needs for precision molding and higher productivity. The series is able to adapt from thin-wall to thick-wall moulding, offering greater flexibility to users. MuCell injection is an innovation of precision injection moulding technology, which significantly reduces the weight of the parts and shortens moulding cycle, improving the buckling deformation of parts and dimensional stability. In recent years, with the development of automotive lightweighting, MuCell is widely used in the automotive industry. The Mucell instrument panel mould of Zhejiang Kaihua Moulds Co Ltd takes injection moulding production to a new level of automation, enhancing productivity. Covestro Polymers (China) Co Ltd will showcase its high-performance, coat-free grade auto interior material, Covestro Makroblend SR60. It increases scratch and chemical resistance for unpainted applications in automotive interiors, and has good impact strength and resistance to heat. High-gloss is achieved with the use of dynamic heat and cool tool tempering. UV-stable interior colours are customisable according to customer requests. Nordson Xaloy Polycarbonate Injection Moulding System is a screw-valve-barrel package that provides exceptional clarity and homogeneity when molding polycarbonate resins. The benefits are excellent optical clarity and significantly reduced black specking, resulting in higher productivity and minimal waste. Applications include automotive lighting, spectacles, data storage device, electrical and telecom components, etc. Cabot China Investment Co Ltd will debut a near-odourless, bluish black masterbatch for auto application. The bluish undertone provides excellent aesthetic elegance. Jet black masterbatch is for effective colouration and retain good physical properties in the final product, and with good dispersion to ensure high glossy surface. It is suitable for direct application using automatic dosing units or by pre-blending, thanks to its ease of dilution and homogeneous mixing. 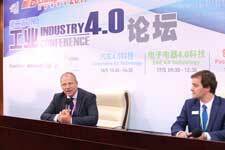 The “Automotive 4.0” seminar at the “2nd Industry 4.0 Conference” last year was a well-received full house event. Adsale Exhibition Services Ltd, organiser of Chinaplas, is again co-organising with VDMA – German Engineering Federation, for the “3rd Industry 4.0 Conference”. World renowned exhibitors will jointly explain actual applications of their technologies with visitors, bringing insights into smart manufacturing from multiple perspectives. Participants can expect plenty of industry 4.0 factory case studies and in-depth application discussions. Chinaplas 2018 will take place on April 24 – 27, 2018 in a new venue, National Exhibition and Convention Centre (NECC), Hongqiao, Shanghai, PR China, with “Smart Manufacturing”, “Innovative Materials”, “Green Solutions” being the show focuses. More than 4,000 well-known international suppliers will be showcasing new technologies in a 340,000 sqm exhibition area, surpassing all the previous editions in terms of show scale. Over 1,500 exhibitors will provide solutions with plastics machinery, materials and technology applicable to the automotive industry. These include BASF, Covestro, Lanxess, Solvay, Sabic, Mitsui Chemicals, LG Chem, DSM, Teijin, Jushi, Sumitomo, KraussMaffei, Kuka, Arburg, Engel, Mold-Masters, ABB, Synventive, Yizumi, Yudo, Runipsys, Siemens, Autodesk, and more. 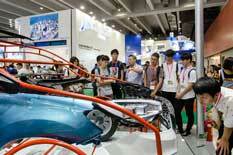 Chinaplas is expected to attract more than 180,000 professional visitors from over 150 countries or regions. So far, a number of global leading OEMs and spare parts enterprises have already pre-registered for onsite visiting, including representatives from SAIC Motor, Geely, NIO, General Motor, Honda, GAC Group, Dongfeng Motor, etc.